In November, they celebrated with Lillian Boutté, the New Orleans singer who founded them along with local musician Mike Genders. They returned to the Alvechurch Baptist Church, where they began nearly three years ago, for a workshop and concert with her. Some of the choir also sang at the Baptist Church December concert a few weeks later. Next they performed in Birmingham Cathedral, at the annual Edwards Trust memorial event, always a moving session to be involved in. This was followed by an evening at Rowney Green, helping the Horticultural Society to celebrate Christmas. 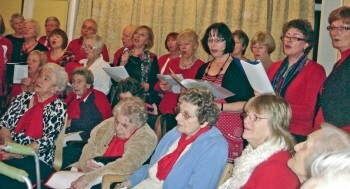 Then they held their second concert at The Lawns involving the residents’ choir. This is a very special privilege for the choir. A group of them worked with the residents throughout the autumn and they performed two sets of songs, a “sentimental journey” and songs from the shows. The residents once again proved their abilities to sing with style, and the audience of friends and relatives joined in. Finally, the choir sang at Cooper’s Farm Shop at one of their late evening openings a couple of days before Christmas – an enjoyable seasonable celebration for all, despite the rain. The choir is looking forward to an equally exciting 2012, including a contribution to the village festivities during the Jubilee weekend in June. If any readers want to book the choir, or join it, see details in the What’s On section of the Village.